Hoffmann Brothers offers fast and reliable air conditioning repair service during the hot St Louis summers. Recently named ACCA’s Residential Contractor of the Year, our HVAC repair technicians are trained to work on any type of air conditioning system repair in your home or business. Each air conditioner, regardless of brand, size or location is never too difficult for Hoffmann Brothers to handle. We strive for the best heating and cooling repair service and that includes fixing your system correctly in one visit. Our St Louis home AC repair prices include all parts, materials, labor, and warranties. We are upfront with our pricing and ensure that you get the best heating and cooling repair service in St Louis. Call Hoffmann Brothers at 314-664-3011 or schedule AC repairs through our website. Looking for Air Conditioner Repair Near Me? When St Louis summers hit, the heat can become unbearable and you need to ensure that you have a reliable air conditioning contractor you can call on to come out and fix your AC unit! You may be asking, “Why is my air conditioner not cooling the house?” We can help! We offer fast, affordable air conditioning repairs. You can rely on Hoffmann Brothers all over the St Louis area during the hottest days and nights of summer. Our AC repair technicians are carefully trained and tested to provide you not only the best technical service but the best customer service in the St Louis area. You can lessen your chance for repairs on your air conditioner by doing regular air conditioning maintenance and cleaning. The #1 breakdown in the summer from air conditioners is a blocked filter or blocked coil. Doing regular maintenance is extremely important for your AC. Hoffmann Brothers offers the Home Protection Plan that provides a tune up on your air conditioner, discounts off repairs across all of our services, filters for life and more! 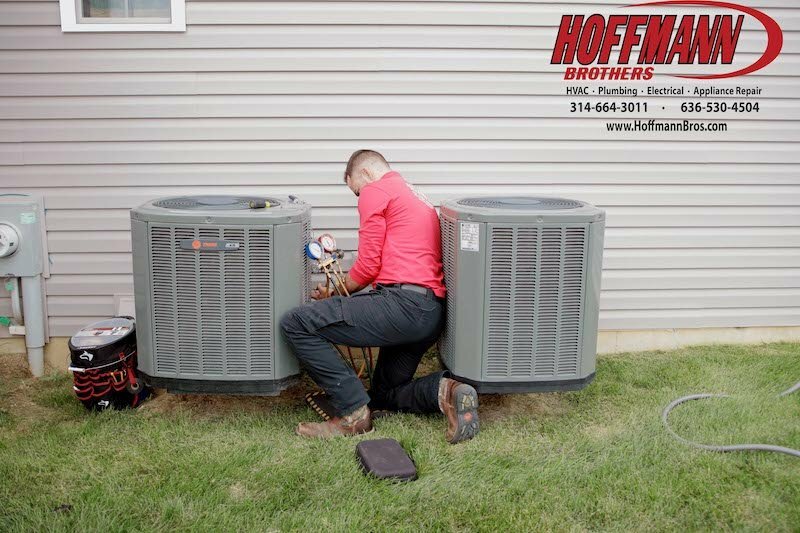 Hoffmann Brothers can be there for you no matter the air conditioning service needed! Your thermostat is not reaching temperature after setting the thermostat. Energy bills have increased. This could mean that your air conditioner is clogged and needs a cleaning or maintenance. Water around the furnace. You coil could be frozen which could be caused by a clogged filter or the air conditioner low on Freon. Your AC is making a loud noise. This could be a faulty motor or debris is trapped inside the air conditioner. If you notice any of these warning signs, you may need to have your air conditioner serviced. Call Hoffmann Brothers to request HVAC service for your heating and air conditioning repair in the St Louis, MO area. We can send out an air conditioner repairman to diagnose the problem on the air conditioner and get you back up and running in no time! Call us today at 314-664-3011. Air Conditioning Installation – Replace or Install a Unit Today! Commercial HVAC Services – For All your Business Heating and Cooling Needs!